Asian suppliers to Apple Inc have begun manufacturing a lower-priced version of its hot-selling iPhone 4 with a smaller 8 gigabyte flash drive, according to two people with knowledge of the matter. The flash drive for the 8GB iPhone 4 is being manufactured by a Korean company, one of the people said Tuesday, declining to name the company. Apple currently sources its flash drives from Japan’s Toshiba and South Korea’s Samsung Electronics. There has been some talk as of late that Apple has begun sourcing Samsung parts from other suppliers amid a nasty patent spat with the Korean consumer electronics maker. It is therefore entirely possible that Apple bought the 8GB NAND flash model from Toshiba, but with the price being paramount for this cheap iPhone 4 we wouldn’t be surprise if the chips came from Samsung, if the price was right. The Reuters report also describes iPhone 5 as sporting an improved antenna, a bigger screen and an eight-megapixel camera on the back. Surprisingly, the sources insist iPhone 5’s form factor is similar to its predecessor, which contradicts the rumor-mill and recent case leaks that point to a slimmer, redesigned appearance. Apple currently offers iPhone 4 in 16GB and 32GB flavors for $199 and $299, respectively, after a two-year service contract. It is unclear whether Apple will remove the two-year old iPhone 3GS from market this Fall and replace it with the 8GB iPhone 4 at a similar asking price or perhaps free? The story corroborates our own speculation that September will see Apple launch two iPhones, a major upgrade that is the iPhone 5 and an inexpensive model for emerging markets that could either be this 8GB iPhone 4 or even a re-worked iPod touch with 3G connectivity added. Interestingly, iPatchiPods told MacRumors that “their suppliers had also relayed that there would be two such models: a less expensive iPhone 4, as well as the expected iPhone 5”. iPatchiPods is a UK-based repair shop that yesterday leaked alleged iPhone 5 parts, including a back camera module with five-megapixel CMOS sensors and single LED flash. As a result, watchers question if iPhone 5 will improve camera resolution and incorporate dual LED flash at all. With today’s news in mind, however, it is entirely possible this part belongs to the 8GB iPhone 4 or even early iPhone 4 prototypes. Whichever the case, it’d be prudent of Apple to slightly update the innards of that device and perhaps use a bit cheaper components in order to keep the price low. 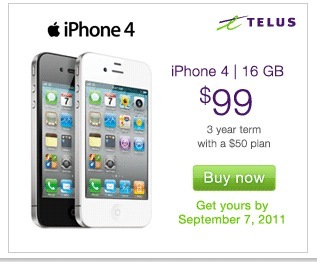 We’re talking about the magical $99 price point indicated by recent price drops by Canadian carrier Telus (see their advert below), as well as Virgin Mobile and Bell who all slashed the 16GB iPhone 4 to $99 in the run-up to iPhone 5 launch.